On the face of it, the PPI situation in the EMU is looking rather grim. Inflation is at 3.6% year-on-year and over six month. Skipping the two highest and two lowest inflation rates in the table of 13 members, inflation ranges from a low of 3.2% in Germany over six months to a high of 12.4% in Portugal over three months. Year-on-year on that same method, Germany has the inflation low at 3% and Greece has the highest on this ‘trimmed basis’ at 6.4%. Not only is inflation high but it is rising. Inflation accelerated in 11 of 13 members from six-month to three-month. Inflation accelerated in 9 of 13 members from 12-month to six-month. Inflation also accelerated in 10 of 13 members, year over 12 months, comparing it to the pace of PPI inflation one year ago. These are clear signs of inflation acceleration. And we know why inflation is accelerating; it is oil. Brent oil prices are up by 59.3% year-over-year and that compares to them falling by 4.5% over 12 months one year ago. Over six months, the pace of the Brent rise is 40.3%. Over three months, the pace is back up to 66.6%. So it’s no wonder that headline inflation is increasing for all these countries on all these horizons. Oil prices have just been hammering away as OPEC and Russia colluded to raise prices by cutting back output. But now that is over and more U.S. production is coming on stream. OPEC is setting a more ambitious production schedule, itself. After rising by 7.4% in May, Brent prices fell by 1.5% in June. 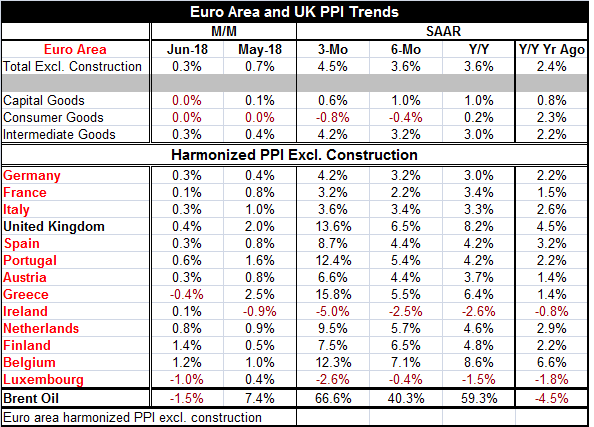 If we look at sector trends, we begin to get a clear picture of what is driving PPI prices and the answer is a loud and clear; OIL! Inflation is wholly- completely and artifact of intermediate goods where prices are driven by commodities and especially oil. Intermediate goods prices are up 3% year-on-year and at a 3.2% pace over six months. They are up at a 4.2% annual rate over three months. In marked contrast, capital goods prices are up by 1% over 12 months, up at a 1% pace over six months and finally up at a 0.6% annual rate over three months. There is disinflation in the capital goods sector. Consumer goods prices are up by only 0.2% over 12 months and falling at a 0.4% pace over six months; they are falling even faster at a 0.8% annual rate over three months. There is disinflation for consumer prices as well. So the headline is being pushed around by oil, but capital goods and consumer goods prices remain subdued. The ECB does not target PPI prices, but these results should still clam nerves at the ECB. The headline is really not very descriptive on what is going on with pricing in the euro-economy. Headline PPI price gains are mostly the effect of oil prices, prices which are now starting to settle back down.